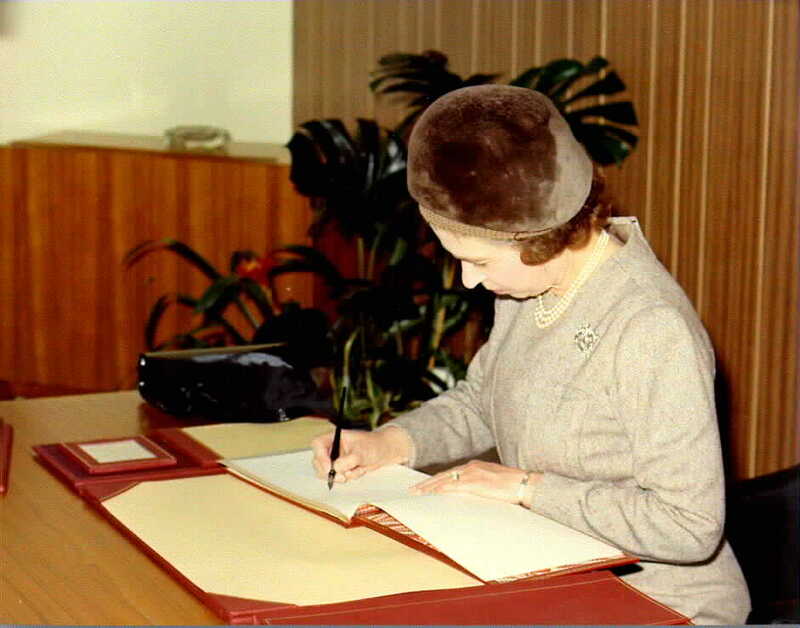 On 26th March 1976, Her Majesty Queen Elizabeth II visited the Establishment to endorse formally our change of name from the Royal Radar Establishment (RRE) to the Royal Signals and Radar Establishment (RSRE). During the visit she became the first monarch to send an email. This occasion was used to inform her majesty of other work and to recognise achievements. 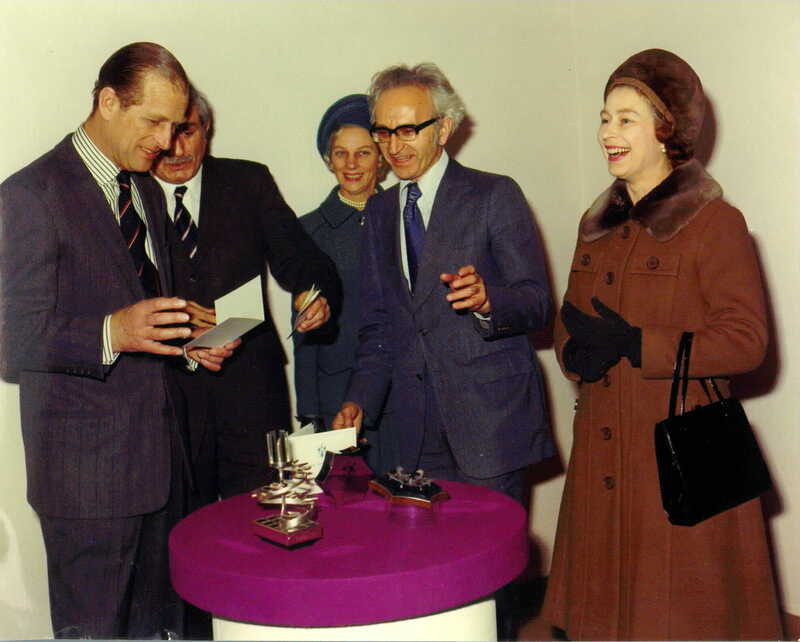 The Queen and Prince Phillip enjoy a joke with Dr Cyril Hilsum and RSRE’s Director, Roland Lees. One such achievement was the commencement of a major collaboration between The UK’s Ministry of Defence (MoD) and the US Department of Defense (DoD) for the development of the DoD’s future standard programming language. This language eventually became Ada, and also was adopted by MoD in succession to the RRE developed language of CORAL66. The collaboration required RRE to be on the DoD’s ARPA net (the precursor to today’s Internet). Her Majesty inaugurated the collaboration by sending an ‘electronic message’ (now called email) to the US Secretary of Defense by pressing a velvet covered computer key. 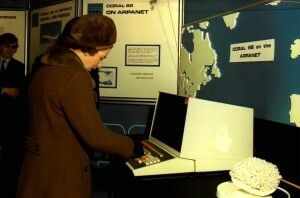 The research computer (a GEC 4080) providing the connection and the link to the ARPA net were in ‘L’ Building whilst the Queen was in B building with a temporary link between the two established using an impossibly crude device (by today’s standards) called an acoustic modem. As a precaution for this link failing, a young scientist was stationed by the 4080 to intervene and ensure the appropriate messages were transferred. 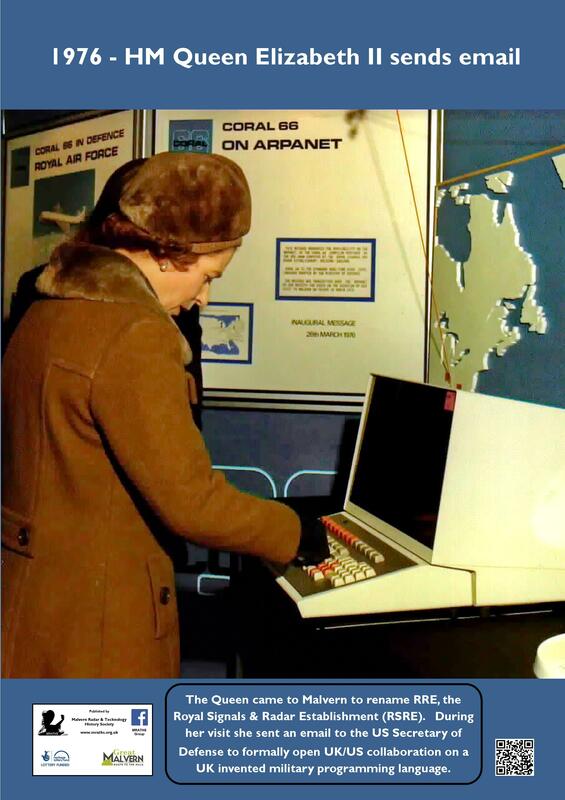 Fortunately, there were no problems and the Queen became the first monarch to send an email.